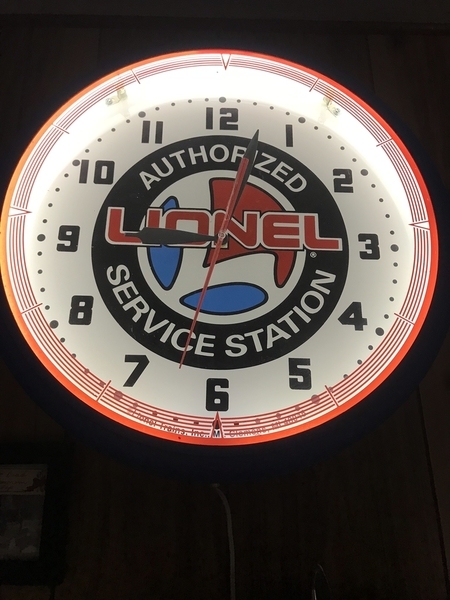 If you are looking for a Lionel neon clock, check this one out. Company gives outstanding service & clocks are very reasonable. Attached pic is my 14" clock which I purchased in the Purple Hall at York probably 20-25 years. It ran fine until now. I purchased the replacement clock movement & had them update it for while I waited & was even able to watch them do the work. Outstanding service. The ones they make now are 20" vs. my 14" & price has not changed much. The 20" ones are the same price as the 14", so go for a 20". Comes like mine & also in blue & red. Go to www.neonclock.com. Phone number is 724-736-8200. You can tell them I sent you if you wish. I just love this clock. Bought one of their first service station clocks at York last year. Someone converted it to batteries. Called them and they provided upgraded electrical movement. New hands and setting mechanics as well as instructions. Great folks to deal with. They also told me this is one of the first clocks they made. Very interesting. They have quite a set-up there at their factory. They are very accommodating. I agree 100% thanks tho John i had them make me a 20'' just a few weeks ago,GREAT COMPANY TO DO BUSINESS with !!!!!!! cincytrains, mine cost $ 228.00 including shipping ,remember the clock is a neon clock ,all of there neon clocks are 20'' now if you don't want the neon ,then you may be able to get a smaller one for less money,give them a call & ask for Valerie Strong ,she was fantastic to deal with very helpful the phone number is : 724-736-8200 ,hope this helps . $50 for china made 12" neon clocks on EBAY. $325 and up for 20" USA made neon clocks. What is The "Time" worth to you?